May | 2015 | My Year Away. And Back. Ancient Ruins, Mile-High Pie, and South Rim Explorations. Oh My! As I head toward the final stretch of My Year Away, I find myself looking forward to the new academic year and at the same time desperately trying to fit in just one more adventure before my care-free life comes to a screeching halt. Thus, when I found myself with the opportunity to visit Greece, Turkey and the Grand Canyon all within a few days of each other, it seemed the only logical thing to do. First up: A pilgrimage of sorts following in the steps of St. Paul’s second missionary journey. Due to a cancellation at the last minute, my friend Kathy invited me to tag along with 35 of her church friends. Given that I have always considered myself adverse to organized tours, the thought of 10 hours on a plane left me squirmy, and I typically get motion sick on buses (of which the majority of this tour would take place), I was a little surprised that I agreed to go. I did, indeed, get motion sick. 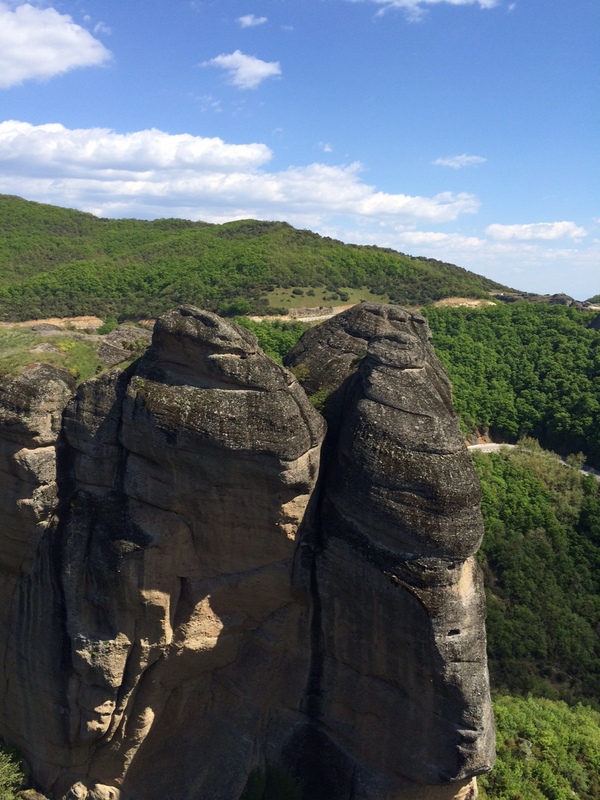 The hairpin turns creeping up the mountains to reach the Meteora region where a handful of monasteries were nestled atop precarious mountainous cliffs was worth the bellyaching drive. Can you see the monastery way up high? But what really got to me were the ruins. Particularly Ephesus. Amidst the demise, it was easy to imagine the hustle-bustle of the ancient seaside (now about six miles inland) city. It was amazing to learn about the sophisticated building practices (running water and air-conditioning!). And it was sobering to think of St. Paul facing hostile crowds in the marketplace. 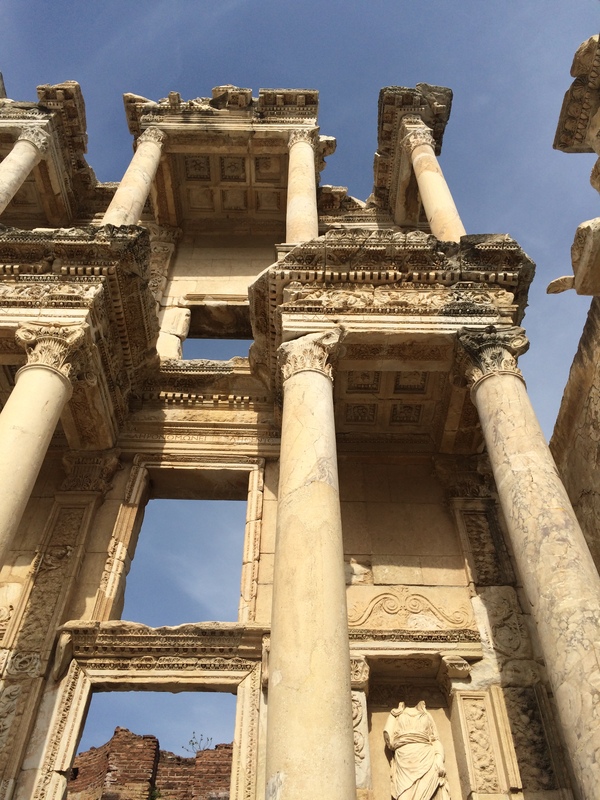 Here’s the library at Ephesus. This trip was not what I would call relaxing. We were in a different hotel just about every night. We had at least two major stops each day (with separate tour guides at each site); you had to pay attention. But if you want to see a lot and learn a lot, well, a guided tour is the way to go. I surprised myself with how much I enjoyed the experience. It’s hard to capture how big Ephesus is. Next: just a brief respite at home: And I’m talking brief here. I barely had time to do my laundry and repack in order to head to Phoenix for an accrediting council meeting and then on to the Grand Canyon. Considering my I’m-not-really-connecting-with-the-academic-world-right-now mindset of my sabbatical, I was flabbergasted by how much I enjoyed the council meeting. (I’m an elected member of the council, which oversees the accrediting process of our 119 accredited journalism and mass communications programs.) Maybe it’s a sign that I’m getting ready to re-enter Academia Land. After a day and a half of meetings and record temperatures in Phoenix (101 degrees to be exact), it was time to drive four hours north to the Grand Canyon. But first: a stop at a pie shop: Sure, some people wouldn’t stop. But, when it comes to pie, I’m not “some people.” Anyone who knows me knows I’m rather obsessive about pies. And, more particularly, I’m quite snobbish about pies. I’ve been making pies for nearly 40 years (and eating them for far longer!) and I continue to marvel at how few people can make a decent pie. 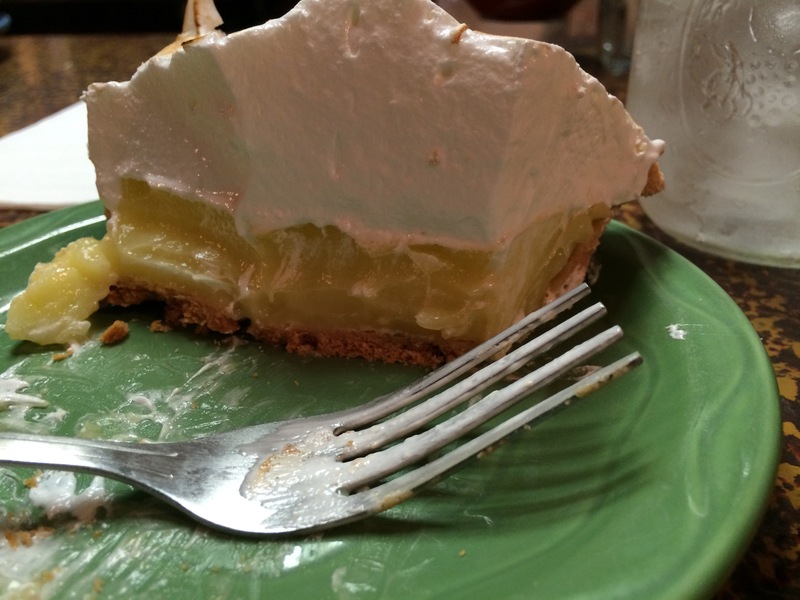 So when I learned there was a “best pie in the universe” hole in the wall off the highway heading toward the Grand Canyon, the only question for me was, “Which pie will I choose?” I discussed this predicament with my waitress and there was no simple answer, but I ultimately decided on the lemon merengue. It was good. The lemon filling nicely tart. The pie was good. But it wasn’t up to the Pie Poobah’s standards! The merengue was piled high. But the crust was average. Simply put, a pie is not life changing without a flaky piecrust. Of all the pie eating and pie making I have done, in my humble (okay, not so humble) opinion, only Grace Alworth (my daughter), Marcie Hinton (the friend with whom I am able to cook), and Emily Wert (a master pie baker and gingerbread house maker) can make a mouth-watering pie. I’ve spent a lot of hours trying to figure out why so few people can make a memorable pie—and also why so few people know what a truly lovely pie tastes like. I guess I shouldn’t be surprised. After all, most people have not had fresh-from-the boat shrimp either. Or handpicked strawberries. (I’ve had both just this week.) I just plain feel sorry for the human race. And, last: on to the Grand Canyon. I contemplated the sorry state of our gastronomical world all the rest of the way to the Grand Canyon. Finally, I got to the park, found my room at the Yavapai Lodge (easier said than done) and hit the sack, wanting to be ready for my big day hiking the South Rim. 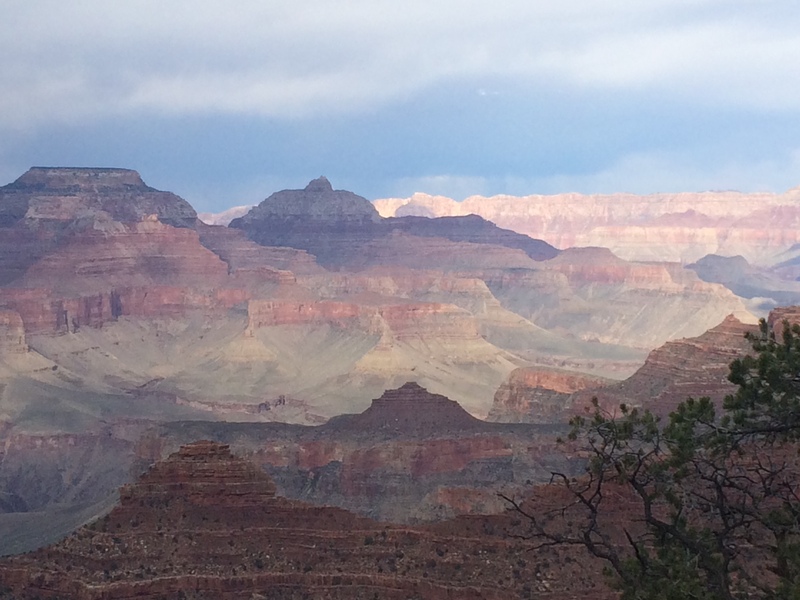 Here’s what you need to know about my day hiking the Grand Canyon. I am scared of heights. And I get kind of lonely when I spend a lot of time by myself. I’m not sure that the day changed either of those things for me, but I do know that something fairly profound happened to me that day. I started the morning by taking the shuttle to the Bright Angel Trailhead stop. This is about in the middle of the South Rim Trails. I figured I’d walk west in the morning, hop the shuttle back, break for lunch, return to the middle and hike east in the afternoon. The first big surprise to me was finding the canyon. It didn’t seem appropriate to ask for directions. I mean, seriously, I was in the Grand Canyon National Park. The canyon had to be somewhere close by! I still couldn’t see it when I got off the shuttle. But I dutifully walked up what looked like a legitimate trail and, WHOA, there it was. Now, I’ve seen a lot of incredible sites this year. After all, I had just returned from Greece for cryin’ out loud. But this was different. First, it’s humongous. But, it’s also beautiful. Stark. Peaceful. And ever changing. I’m not kidding. It seemed like every time I stopped on the trail to have a look, the view had dramatically changed. I had to force myself not to take pictures every 30 seconds. More than once, I found myself let out a little gasp at the wonder of it all. The South Rim trail itself was also a sight to behold. I started out on a nicely paved path, thinking about what a lovely trek this would be. I had considered hiking down into the canyon until I read about the provisions I was supposed to have. Other than one bottle of water, I was empty handed. I also figured if I fell, it might be a long time before anyone found me. (Someone had fallen and died the day before so I wasn’t being a total wimp.) I opted for the safe route. But a few miles in, even the safe route was a bit of a challenge. First off, the nice paved path ends and is replaced with an uneven, rocky and crazy-close-to-the-edge trail. There was more than one time when I couldn’t look down for fear of falling. But with each mile, I felt more peaceful, more alive, more connected, and more in awe. I occasionally passed fellow hikers, but for the most part, I was alone. I rather enjoyed myself. But, several hours in, I had to start telling people about what I was seeing. I started posting pictures to Facebook about every 15 minutes. I started calling my husband, trying to describe what I was seeing. Then I started sending him pictures with messages like “This is where I am right now!” Then I called him to make sure he got the text. I knew millions of people visit the Grand Canyon every year. But until I was there, I didn’t really understand why. I’ve had a few days to contemplate my recent crazy travelling schedule, trying to figure out how it has helped me reflect on administration and how it has helped renew my tired administrative spirit, and here’s what I’ve concluded. This whole trip freed me to be who I am right now, not who I was. I met all sorts of people during my travels. When they asked me what I do, I usually said, “I’m a professor.” Sometimes they would want to know more and then I would tell them about my research or what I’m teaching in the fall. I hardly ever told them about my administrative past. It felt good. And it felt right. I’m finally over jet lag. (Travelling seven hours ahead and then a few days of “normal time” and then travelling three hours behind can do something to a body!) I’m back at my desk now, contemplating Third Person Effect and crunching statistics. But I find that I still scroll through the pictures stored on my IPhone. They’re all there. The Acropolis. The Corinth Canal. 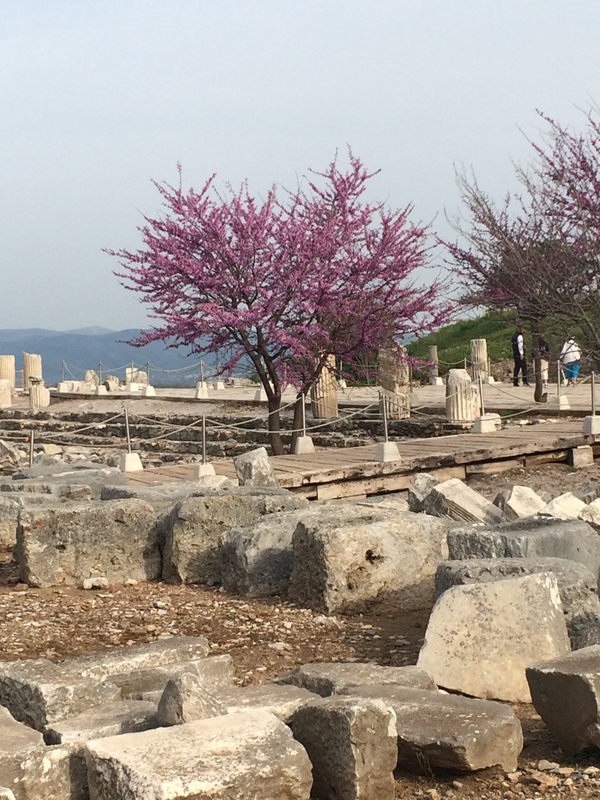 The Sanctuary of Apollo. And the Grand Canyon. And pie. Categories: Uncategorized | Tags: accreditation, Ephesus, Grand Canyon, Greece, jet lag, Pie | Permalink.